After five years, Australia’s cricket team is returning to Sri Lanka. Their tour of the island begins on 26th July and will run for six weeks, during which the team will play five ODIs and two T20s, as well as the three test matches. Sri Lanka will be keen to prove themselves on their home turf, especially in light of their recent disappointment in the World T20. The reigning champions were knocked out in the quarter finals following a dramatic clash with England where they were defeated by ten runs. During their last tour of the island in 2011, Australia won the series 1-0 after the teams drew 2 out of the 3 Test matches. Of the 13 Tests the team have played in Sri Lanka, Australia have won six and lost only one, in 1999. 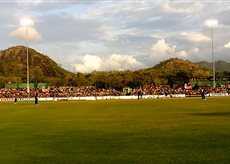 The tour will – unusually – begin in Pallekele (near Kandy), a move made to reduce the risk of the test clashing with the historic Kandy Esala Perahera. This is a Buddhist festival held in annually in August, during which the sacred tooth relic of Lord Buddha, usually housed in Temple of the Tooth, is paraded through the streets. They will also be playing at grounds in Dambulla – part of the Cultural Triangle – and Colombo, as well as the Galle International Stadium, which boasts views of the Indian Ocean and the iconic clock tower of the 16th century Dutch fort. 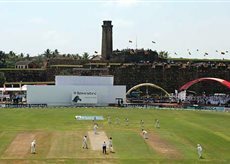 The match locations are all convenient for visiting some of the best tourist attractions the island has to offer, such as the gems of the Cultural Triangle and the UNESCO World Heritage Site of Galle Fort. Even those who don’t want to miss a moment of the action will be hard-pressed to ignore the incredible surrounding historical sites and beautiful beaches of the south coast. With over fifteen years of experience, Red Dot Tours have become experts at putting together tailor-made tours to suit all tastes and budgets. We can create your ideal itinerary, whether you want to be exclusively immersed in the action throughout or just catch a match or two during a whistle-stop tour of the island whilst also seeing the best Sri Lanka has to offer. We began life in 2000 as a company solely dedicated to organising cricket tours to Sri Lanka and it is a passion that still remains with us, despite our growth into one of the island’s leading travel companies. Sri Lankan cricket is an obsession for Red Dot – no one rivals our specialist knowledge and no company can claim to have stronger foundations within the cricketing community. Cricket is also an obsession for Sri Lanka. The country has an insatiable appetite for watching matches, a heart-warming appreciation of the players’ talent – and not just the members of their home team – and an undeniably genuine love of the sport. Australia’s upcoming tour of Sri Lanka promises to bask in an unbeatable atmosphere from beginning to end. This is a tour that cricket enthusiasts will not want to miss. Can you buy beers at the cricket grounds? Hope this time Sri Lankan team will be winner of the series.